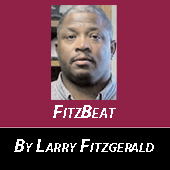 Are the Vikings the team to beat? Time will tell. That’s what many are saying now that the Vikings have signed the NFL’s number-one free agent star quarterback, Kirk Cousins, to a record $84 million guaranteed contract. Viking’s ownership is not backing off, going all out to win Minnesota’s first-ever Super Bowl. Never before has an NFL team signed a player to a multi-year, fully guaranteed contract. The Vikings are now armed with one of the NFL’s top defensive units; clearly one of the NFL’s best stadiums, U.S Bank Stadium, home to Super Bowl LII; and now maybe the finest office-headquarters-training sites in all of sports, Twin Cities Orthopedics Performance Center in Eagan. The unrestricted free agent period started March 6, as did the official 2018 year of business. All 32 teams will work with salary caps of $177 million per team. Cousins was the target of four teams — the New York Jets, Denver Broncos, Arizona Cardinals and the Vikings — all wanting to upgrade and looking for a star quarterback with talent, durability and the numbers. Cousins has thrown for at least 4,000 yards and 25 touchdowns minimum the last three years as the starting quarterback for Washington. In 2017 he was 347 of 540 for 4,093 yards and 27 touchdowns, 13 interceptions, and a passer rating of 93.9. After six years in Washington, D.C. and a modest starting record of just 26-30, Cousins commanded the attention. His NFL market value was rumored to be around $100 million. Somehow the Vikings blew away the other three teams — it was no contest. 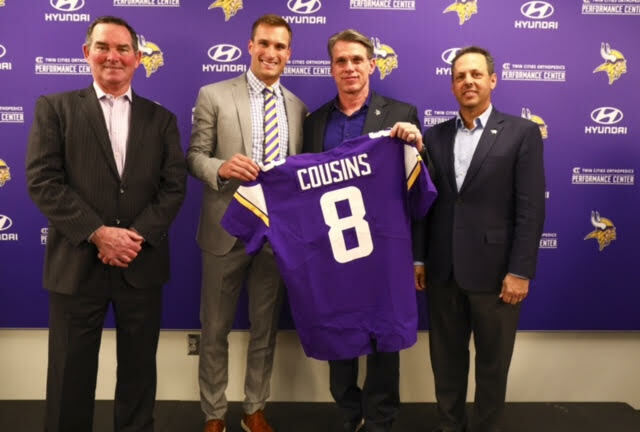 Cousins said during Super Bowl week he was in town and visited the Vikings headquarters in Eden Prairie, Winter Park, and the Vikings’ new state-of-the-art training site in Eagan. 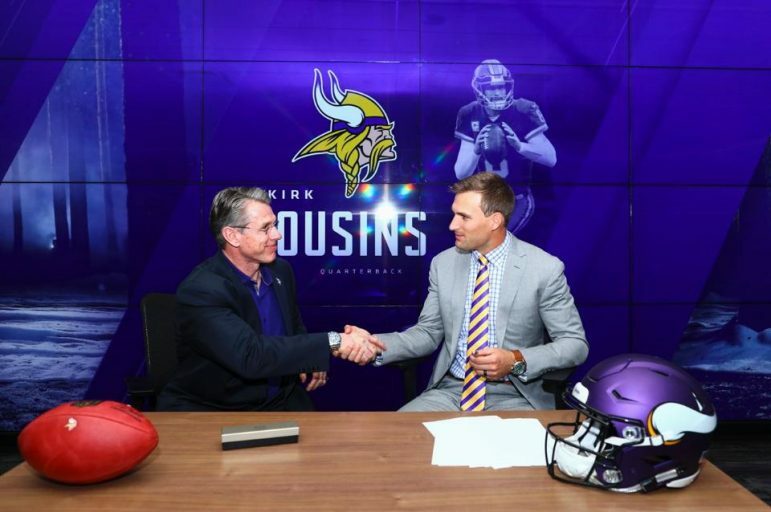 “Sam Bradford, Teddy Bridgewater, and Case Keenum are phenomenal players and did a phenomenal job, not only on the field but how they represented this organization off the field,” said General Manager Rick Spielman. Amazingly, Keenum signed with Denver, Sam Bradford with Arizona, and Bridgewater with the New York Jets. “Rarely do you get an opportunity to get a quarterback at Kirk’s age and status as a football player,” said Spielman, “not only what he is and leads on the football field, but what he does off the football field. And we felt as we went through our process and did a lot of study on all of our guys. So just like that, the Vikings get the top guy and have a clear-cut leader and starting quarterback, Cousins, for the next three years. For a team that went 14-4 last year, won its Division, and reached the NFC Championship game, does this put the Vikings over the top?